I have to admit, I was skeptical at first about this Curate bar because of its appearance. The seeds in it gave me the impression it was going to have a more earthy flavor. I am so glad I was wrong. 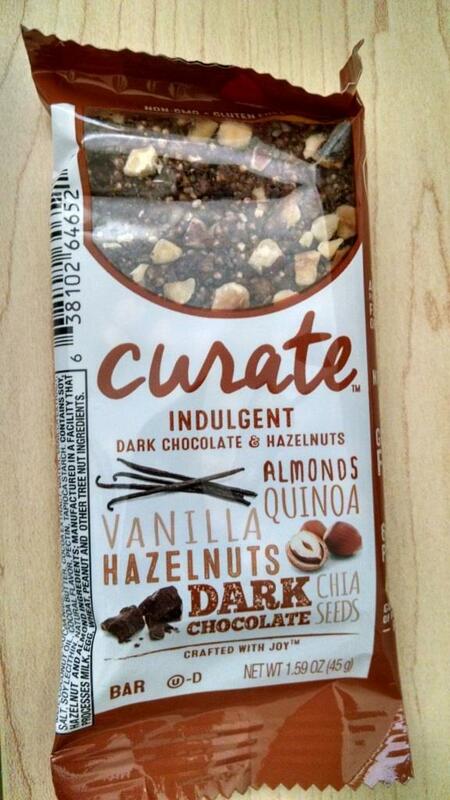 The Curate Indulgent Dark Chocolate & Hazelnuts bar was excellent. Good cocoa flavor. I didn’t really taste the hazelnut – I thought it had more of a chocolate/fruity flavor. At first I thought maybe there were dates in it, but there aren’t. It could be the agave nectar syrup. Who knows. Honestly, I don’t care. I like it. Calories – 200; Total fat – 11g; Total carbs – 22; Fiber – 4g; Protein – 6g.